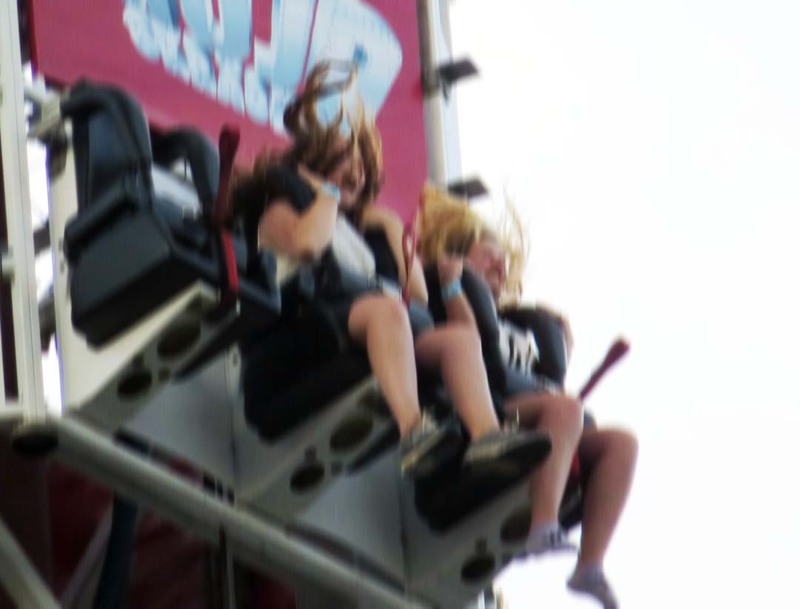 On my way to work three or four days a week I pass Gothenburg’s Liseberg funfair and hear the happy screams – I must suppose they’re happy – as people drop in free-fall or spin around at multiple gravities or turn upside down as they loop the loop. It’s a good 40 years since I last experienced any of the more extreme rides at a funfair. Even longer since I enjoyed any of them. About 10 years ago, having refused to try out any of the real rides, I was persuaded by visiting friends to go on Liseberg’s virtual roller-coaster. Along with about 40 others I was strapped into chairs that moved and vibrated facing a wide projection screen. Together we went on a ride through a fantasy gold mine, spinning through tunnels, leaping over broken bridges, plunging down shafts. I spent most of the time with my eyes closed, teeth clenched and fingers clawing at the armrests. I am put in mind of all this because, ever since I started writing about crowd funding, I’ve had the sensation of being once again strapped into that chair as the ride takes me ever closer to a cliff edge. I’ve not written about crowd funding for a couple of weeks. Partly because I had other things I wanted to say, partly because the ride hasn’t picked up much speed yet. But I can feel an acceleration and there’s no getting away from it any more. Having rejected Unbound for the time being, I’ve been focusing my attention on FundedByMe.com. The first is dedicated to book publishing while the other is open to all sorts of campaigns. Apart from that major difference, another contrast is that FundedByMe sets a 45 day limit for any crowd funding campaign. In other words from the day the campaign starts, a campaigner has 45 days to attract the financing he or she is seeking. By contrast Unbound has very open limits. Their campaigns can take months or even years. I don’t like the idea of a campaign that just drags on into the sunset, but I have to say that 45 days strikes me as a bit restricted. However, thinking in terms of a 45 day campaign for a couple of weeks, I’m coming around to seeing how I might manage it. All this is in aid of publishing a photo book about Gothenburg. That means it makes sense to start the campaign with Gothenburg’s Planket in mid-August and end with the Gothenburg Book Fair at the end of September. Just about 45 days. Planket is an event run annually by Gothenburg’s Photo Club in association with Gothenburg’s Culture Week. The photo club hire the palings around Trädgårdsföreningen Park. Then they rent out three-meter-wide sections to photographers where they can display their work. I took part last year and it was great fun. Suppose I was to take part again this year? Suppose I exhibited some of my photos and had a dummy of the photo book to show off? I’m already booked to take part in Planket, but that only costs SEK 200. Participating in the Book Fair and getting a share of the stall that Egenutgivarna run costs rather more – SEK 3750. So I haven’t taken that step quite yet. I’m hyperventilating before I release the brake and let the roller-coaster roll. It’s also difficult to make up my mind what my financial target should be for the campaign. I’ve written a description of the book as I would like it to be and I’ve sent off a letter to various printers asking for quotes. (No replies as yet.) I’ve used a couple of websites to make a rough calculation and I think I’m looking at a target of SEK 150,000. That’s US$21,880, €16,300, £12,850. Sometimes (usually as I’m falling asleep) that seems like hell of a lot of money. Except of course that I won’t be home and dry. If I reach my target within 45 days, I’ll be committed to printing the book and distributing copies to everyone who has pledged. So I have to be very careful not to make promises about when the book will be published. I’ve absolutely no idea how long it might take. Of course, if I don’t reach my target within 45 days I won’t have to do anything. The whole project will be cancelled. Everyone who pledged will get their money back and I’ll be left with fond memories and small debts. The only fly in the ointment regarding this 45 day period is – I have a 10 day holiday planned in England right in the middle. Perhaps I can try marketing the project also while I’m in London. Anyway, that’s where I am at the time of writing. For more on this, check back later. I originally published this article for the separate At the Quill website. Transferred here with some polishing for SEO, updated links and a better featured image on 9th November 2018. This article was written for the #Blogg52 challenge.